Gustave was also intrigued by the challenge of elevating an everyday, overlooked item into something special. “It’s exciting to change the material,” she notes. Cardboard has a lot of inherent qualities — it’s dirt cheap (or free when plucked out of a recycling bin), biodegradable and incredibly strong (if thick enough, it has a comparable rigidity to wood). But it’s often hard to admire the beauty in the brown paper packaging when it looks like, well, brown paper packaging. After years of experimenting with different ways to cut, assemble and transform cardboard, Gustave started her own cardboard decor company, Pas a Papier, in 2006. Her pieces are so startling — lampshades that look like fabric, bowls that look like she made them on a pottery wheel — it’s hard to tell what they are made from. And Gustave’s not the only designer who is turning beige into bling. Lured by its eco-cred and malleability, many other innovative minds are also playing with paper. Here, seven fun ways to box up your home. Ottopapax’s Pliage No. 1 stool is extremely economical. It’s easily assemble from a single sheet of cardboard and costs about as much as a meal at Jack Astor’s ($30 to be precise). The vibrant pattern conceals the seat’s origin as plain old paper and creates a trompe l’oeil, giving a sense of depth to the flat sitting surface. Through ottopapax.com. By cutting, layering and gluing together strips of cardboard, Pas à Papier’s Marie-José Gustave shows off the material’s versatile texture. Her Chaise Entre Ciel et t’R has a beguiling grain similar to an exotic hardwood. 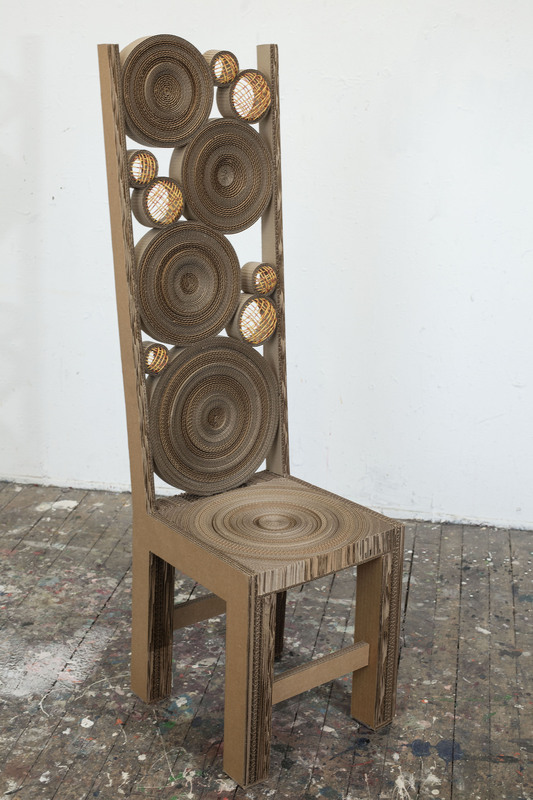 The chair’s light look belies cardboard’s inherent strength. Through mariejosegustave.ultra-book.org. Otra – a Quebec-based studio started in 2011 by recent design grads Julie Ferrero and Guillaume Darnajou – upcycles cardboard by incising it with edgy patterns and adding bursts of colour. 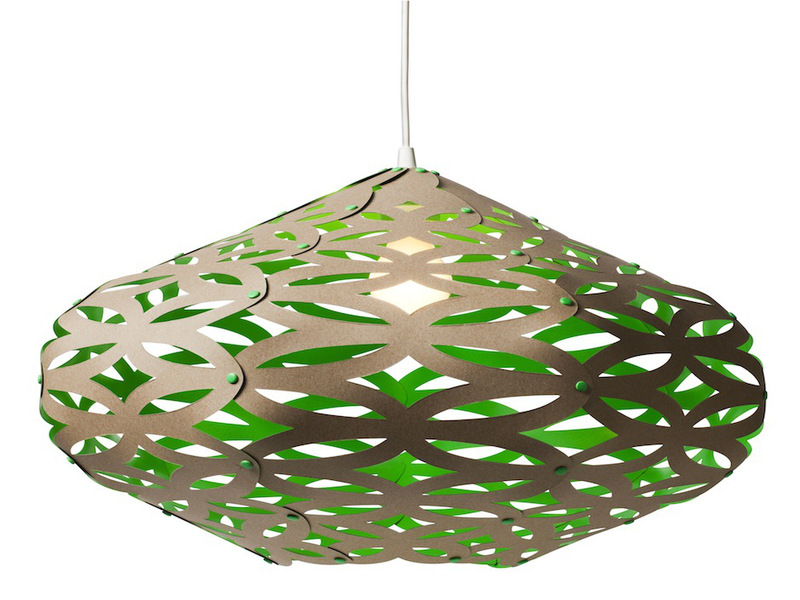 Its Craft lampshade is held together with brightly hued tacks to avoid using glue. The crisscrossing cutout creates beguiling shadows. Through otra-design.com. Dutch-based design firm Moooi is known for its ultracontemporary, high-concept furniture, but its Paper Family of products plays with the type of craft that even a grade schooler would recognize – using papier mâché to transform paper and cardboard. 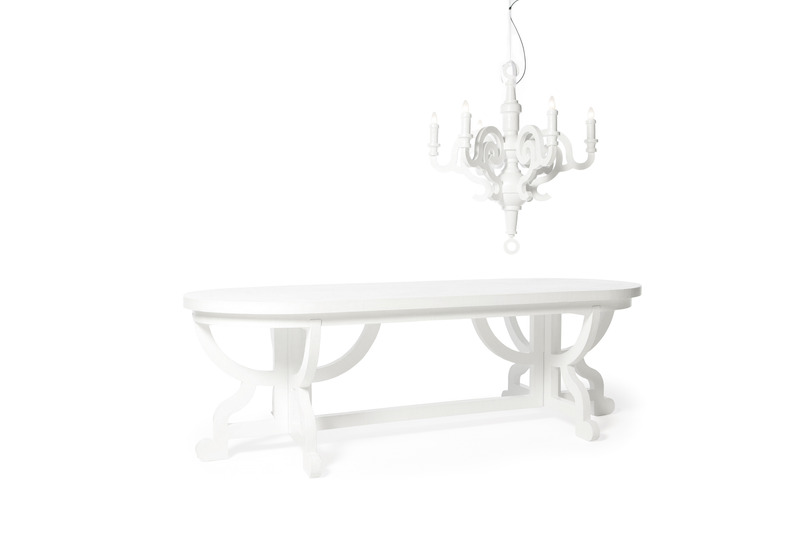 A polyurethane lacquer seals the dining table so that you can eat without fear of melting the surface with a spill. Through moooi.com. 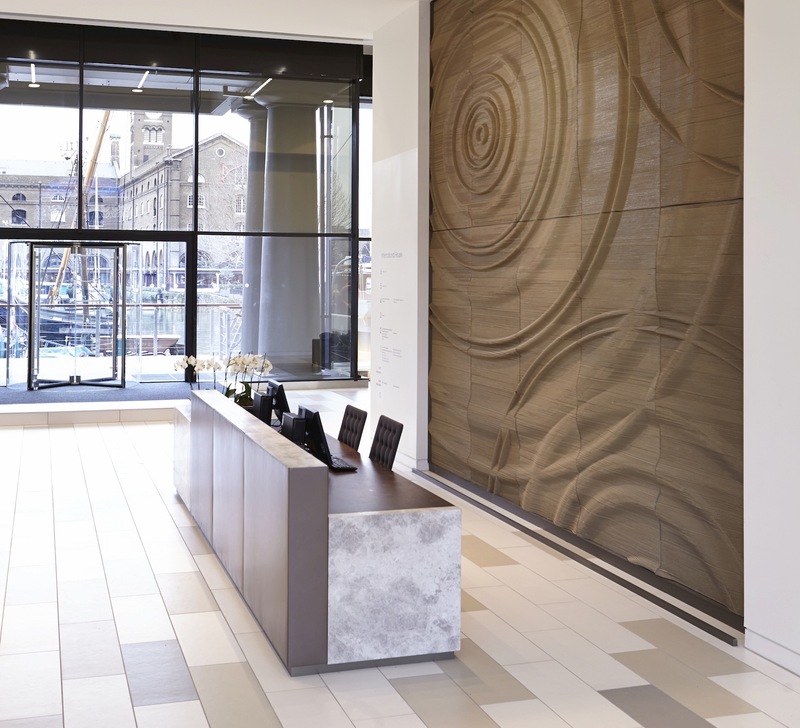 Cardboard’s soft-yet-rough, organic texture stands out in the slick, hard-edged lobby of International House, a high-end London office building. 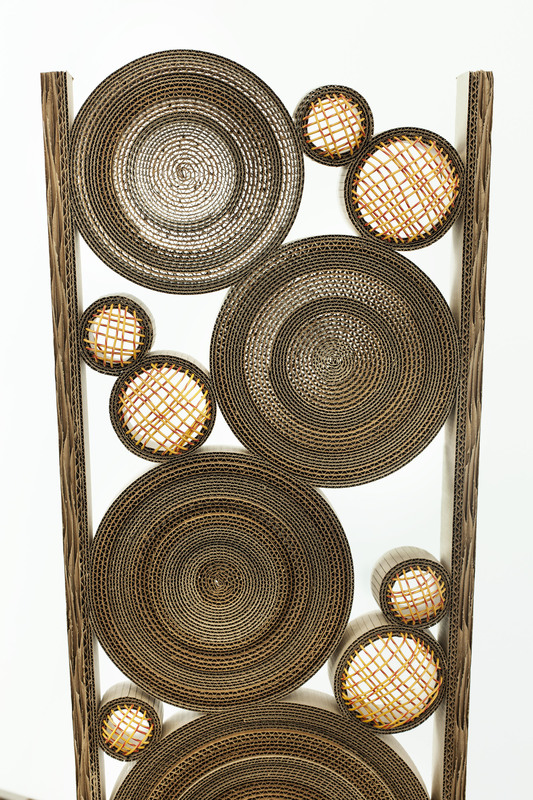 British designer Giles Miller sculpted the corrugation to give it a flowing, liquid look. gilesmiller.com. 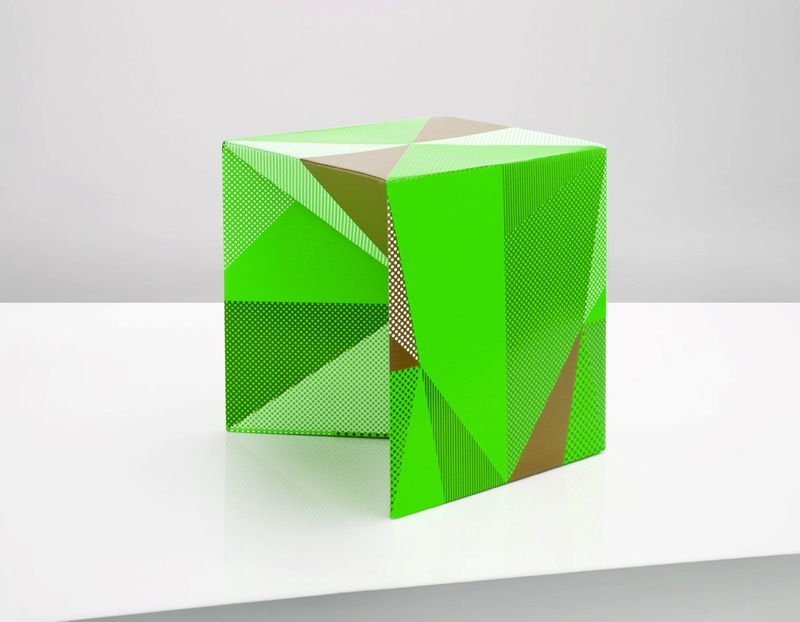 Philadelphia-based firm Mio believes that ethically produced, aesthetically pleasing design should also be accessible. 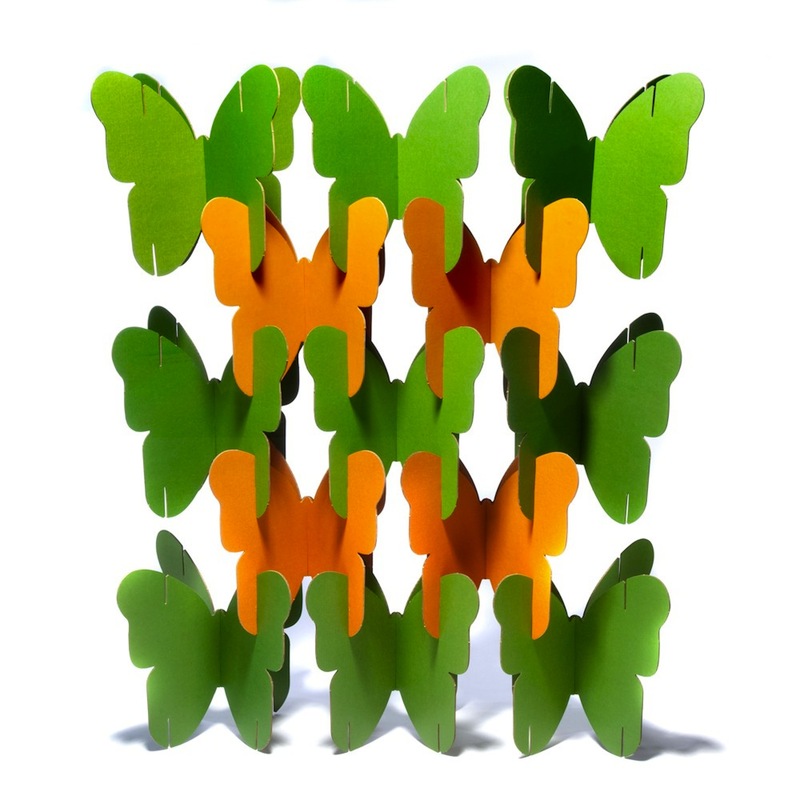 Its Butterfly Nomad system, which has 24 modular blocks that can be arranged into a charming room divider, is not only affordable – it costs $60 – it’s also virtuous. The cardboard is made from a mix of sustainably harvested wood chips and recycled paper. Through mioculture.com. 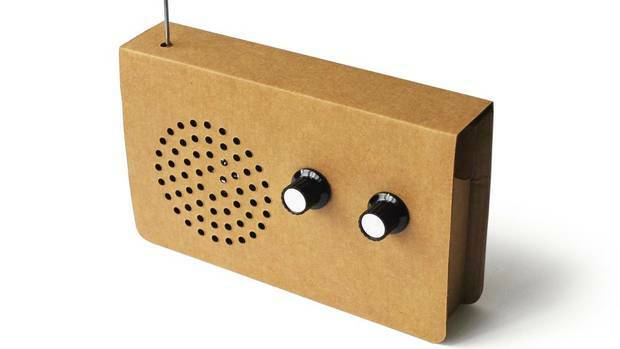 Chris McNicholl’s Environmentally Sound radio looks like a retro prop from Wes Anderson’s Moonrise Kingdom and displays an ingenuity any Boy Scout would admire. No glue is used so, aside from the speaker and knobs, it’s entirely recyclable. And although assembly is DIY, all the components come from a single sheet of cardboard and slide together with minimal effort. Through chrismcnicholl.com. This entry was posted in Design Spy and tagged Cardboard, Decor, Design, Furniture, Quebec, Radio, Table, The Globe and Mail by mmhague. Bookmark the permalink.